Bertrand Chaffee Hospital in Springville has been designated as a drop-off site for unused or expired prescription and over-the-counter medications on Saturday, April 29 from 10 a.m. – 2 p.m. This is one of several sites throughout Western New York. Law enforcement representatives will be on hand along with volunteer pharmacists, no questions asked. With the growing nationwide concern about abuse of prescription medications, these drop-off events serve as a reminder for individuals and families to look through their cabinets and properly dispose of medications. This program keeps pharmaceuticals out of the water supply and away from children. 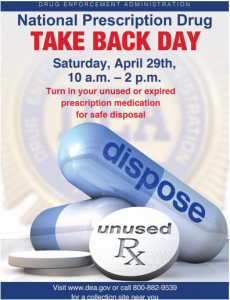 Call 1-800-882-9539 or visit dea.gov for a full list of drop off sites on April 29. Permanent drug disposal boxes continue to be available throughout Erie County, including at the Erie County Sheriff’s substation at 65 Franklin Street in the village of Springville.